I made savoury muffins for the first time in my life today, and i think they turned out pretty okay.I sliced one of them from the centre and toasted it and smothered it with some butter Yum-O! then i tried it with cheese and it was fantastic. They were good, simple, rustic and hearty. I think you can have them for breakfast, brunch, or when ever you desire. Preheat the oven to a 220 degree centigrade. In a mixing bowl, sift the flours, baking powder and salt, set aside. In a separate bowl, whisk together the egg whites, egg, milk and oil until well blended. Add the egg mixture to the dry ingredients and mix gently, stir in the zucchini, basil, garlic, cheese and pine nuts and mix just until combined. Divide batter among paper lined muffin cups (in a non-stick muffin tin) filling each one nearly full about 1/3 cup batter per each. Bake in preheated oven for about 20-25 minutes or until a toothpick inserted into the centre of cupcake comes out clean. Those garden muffins are delicious! thanks for sharing! 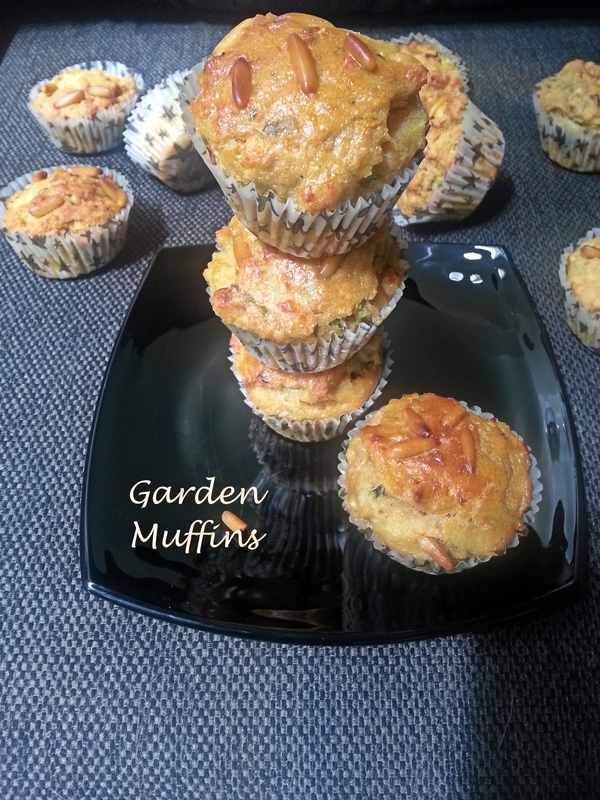 These garden muffins look perfect and very good with all these herbs 🙂 I love Romano cheese and pine nut!